I don't really remember the year I bought my first ever set of Multiblitz heads, but I'd been 'into' photography for awhile. On a trip to London I'd called into Keith Johnson Photographic and noticed they had a three head Multiblitz set-up second hand two Ministudio 202's & a Minispot 200 (in production until 1983) with loads of accessories. I bought them on a spur of the moment decision and that was the start of my interest in studio photography. As I didn't have a studio I used to hire community/church halls to practice this new form of photography and became quite adept at the quick set-up and breakdown of equipment. The most ambitious project involved a custom motorcycle (Kawasaki 900) and two models in swimwear; unfortunately all the images from that session were lost in a flood some years ago. The Ministudio kit gave way to a brief (very) dalliance with the rather innovative Profilite 200 (1980 - 1985 production period). This was a modular head that could be split into three sections; power supply, controls and flash head. What made this so interesting at the time was its ability to remove the mains power section and replace it with a 12 volt one which could run from a car battery. This was rather revolutionary some thirty years ago unlike these days where there are now many portable solutions available for outdoor photo-shoots when no mains power is available. My time with these heads was quite brief as I found them under-powered to use in even moderately bright sunlight, so ended up trying them out either in the early morning, late evening, in dim woodlands or old buildings. The other problem was that I never really felt comfortable using a large light modifier on a basically plastic ‘clip together’ flash head! 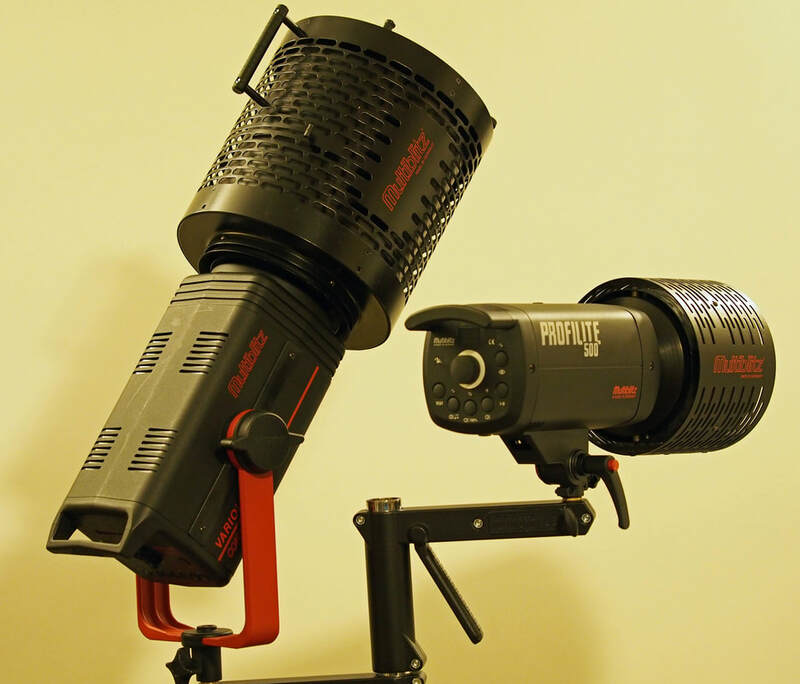 So the Profilite’s made way for the Minilite 200’s (in production from 1982 to 1994) which became my studio flash heads for nearly 30 years. 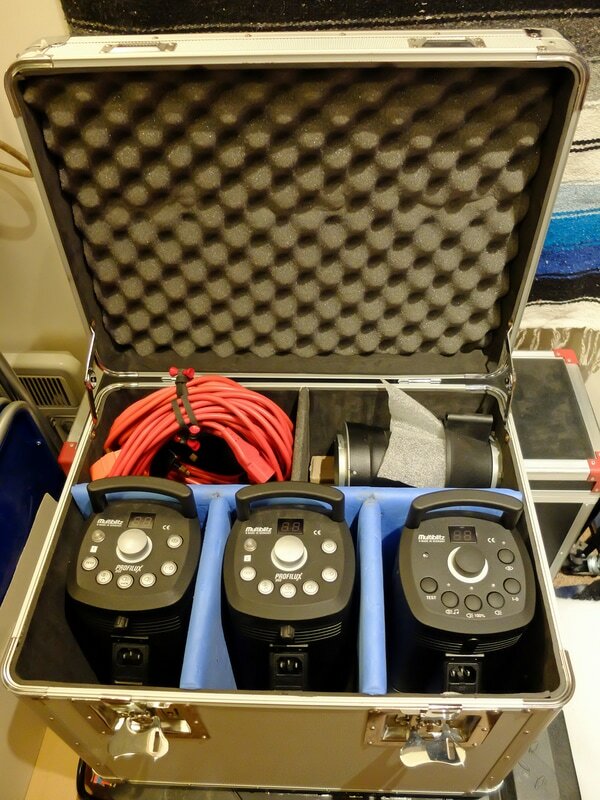 Indeed many photographers I've spoken to over the years have fond memories of this kit with it's ability to pack everything you need into a large single case. Mine was a three head kit with; reflectors, snoot, honeycomb, gel holder (with glass gels) barn-doors and two small umbrella's. It was supplied with a second bag which held three compact stands, which I'm still using today. The only modification I made to the heads was to 'cut' the captive mains lead, 9 or so inches from the head and fit an IEC socket so I could use 'loose' mains leads, which made the kit faster and easier to pack away. I also added a standard stand mount to the heads (Manfrotto 014-38) so they could be used with most modern stands. One of the major restrictions in the use of the Minilites was the lack of adjustability with only full and half power available. But with a bit of imagination, some neutral density gels or simply moving the lights it never really proved to be a problem. Of course now that I'm using fully variable output lights I wouldn't want to return to just full and half power options. On the upside, unlike many modern units the modeling lamp where very cheap and seemed to last 1.000's of hours, when I bought the lights I bought a ten pack of the little halogens and I still have eight left after all these years! 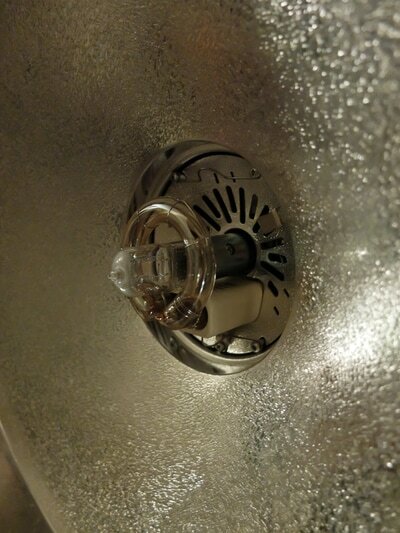 They were only 50 watts, which is quite low powered by the standard used in many brands, but they always seemed fine in use and certainly a lot more comfortable in the context of the heat generated than other heads I've used with 250 watt bulbs. Other differences between these and more modern units: inability to switch off the slave cell and the ready confirmation (fully re-charged and ready to fire) was restricted to the little red light on the back, which wasn't always easy to see - but that was about it really. For its time I feel the Minilite 200 was a fabulous studio flash head and one I'll always have fond memories of. I have one diminutive Compact Plus, which is a very basic 200ws head, with rather minimal controls; just 'main' on/off, slave cell on/off, manual trigger and output control. The modeling light is permanently on, going 'out' when the unit is triggered, coming 'on' again when the unit is recharged ready to fire once more, it also didn't auto dump energy when turned down so required a manual flash prior to taking the picture to ensure the output was reduced. 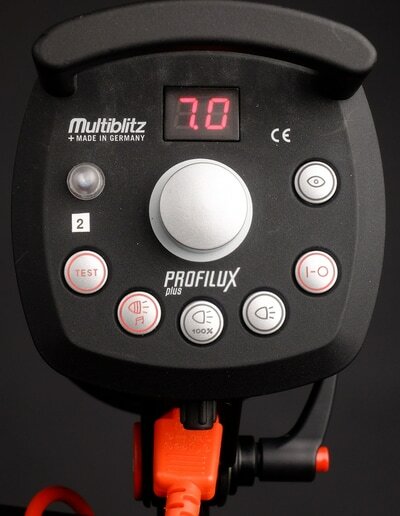 This head was upgraded by Multiblitz to mark 2 status which added a digital output display, the ability to switch off the modeling lamp and audible ready signal, auto dumping of excess charge & an extra stop of output adjustment. So a vastly improved version as far as I'm concerned, but that was after I'd already bought a mk1 so for now I'll be sticking with that. It is a very light weight head and the main body is about the same size as a paperback book so great for getting into small places or mounting on a boom arm for effects lighting. For some, the major disadvantages of this unit could be the slow recycle time (2 seconds) and the previously mentioned lack of the auto dump facility, but for me it was less to do with the performance of the unit, but (in my opinion) its rather light weight build quality! 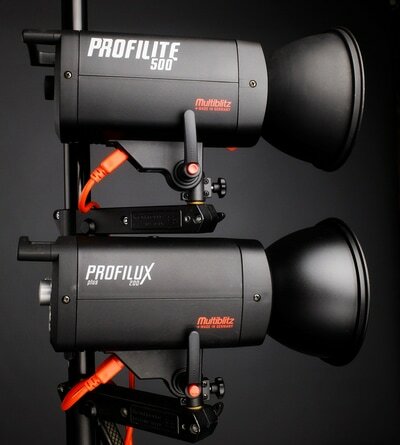 Next down we have the Profilux Plus - again 200ws heads, also available in 400 & 800ws versions - of which I have two. These are a whole league above the Compact Plus in both features and specification. They have a far faster recycle time of only 0.6 of a second and a flash duration (t.5) of between 1/3000th & 1/1200th. They also have built in radio receivers, so not only can they be triggered with any of the Multiblitz transmitters (see later section) but using the Trigger Happy unit with which they can be; switched on & off, cycle through the modeling lamp options and have their output changed from the camera location. The Profilux Plus has a nice control panel, well laid out and easy to use, but the real selling point for me was the units 7 stop (6 in real terms) output range - from 3 to 200ws (the 800ws version has an even better 8 stop output range) which is far more than many other brands on the market today. This means you can shoot with the lights close to the subject and still use relatively large apertures - it is very useful to have that level of controllability and of course the digital display allows adjustment in 1/10th of a stop increments for a great level of precision. The units are also multi-voltage, so can be used anywhere in the world, just needing the modelling lamp to be matched to the local voltage. 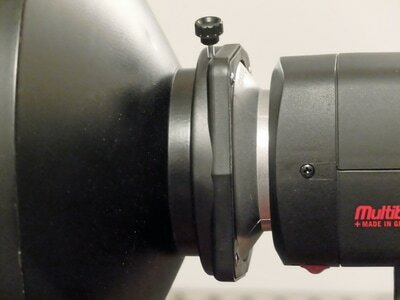 One particular criticism I have of both the Compact & Profilux Plus heads is the stand mount/tilt mechanism which never really feels truly substantial and subject to droop/creep with a larger modifier mounted. The other thing is the stand locking knob on the front of the mount which as it’s placed on the front restricts the overall angle of tilt. The whole thing is very ‘plastic’ and doesn’t inspire (at least as far as I’m concerned) confidence at all. As discussed above, having flash heads with built in receivers, it makes sense to use the available transmitter/triggers and I have one each of the units shown above - the middle one (RS868) is no longer produced but the other to are. They all share a common frequency of 868MHz and all trigger the Profilux (and other Multibliz heads). I generally use the RS868 on my compact camera as it is so diminutive and use the RS2 on the DSLR - I find the Trigger Happy (I really think this is a silly name) to be a bit on the cumbersome side and most of the time this ends up being used as a stand alone remote. Both the older (RS2 & RS868) came as a set with receivers to plug into other (or older, or non-receiver equipped Multiblitz) heads which is useful so I don't have to rely on the photocell on the Compact Plus or the older Variolite head - however one idiosyncrasy is that although all the triggers will fire the Profilux heads, the Trigger Happy won't link to the oldest receiver - the one that came with the RS868, although there is no issue with the RS2. Variolite Compact 900 - the business end! The last head I have is one of the most recently acquired although it is also now the oldest flash head I have, the Variolite Compact 900 (in production between 1992 & 1997) is big and heavy compared to the other heads and uses a different bayonet mount the larger ‘V’ fit as opposed to the ‘P’ fit used by the Compact & Profilux Plus’s. Although it has significantly more power than the other units it still maintains both a reasonably short recycle time and flash duration. I have been considering going to the more pro ‘V’ system heads for awhile to use with larger light modifiers & specialist effects units. However, given my amateur status it isn’t really worth investing in the latest Multiblitz ‘X’ series heads, although it would be great to have a set of these rather wonderful units to use. So it was a matter of waiting for one of the better specified older heads to become available second hand - and this was the one that turned up first. Besides the weight of the unit, there are many positive attributes to this and the more professional ‘V’ mount heads. The mount itself is far superior in size stability, they have the much better ‘U’ frame for stand mount & tilt operation. The downside to this unit for me is the 650 watt modelling lamp, which although it has the ability to reduce the overall output by one and a half stops (and still function proportionally) is far too bright (and generates too much heat) for my little studio. But apart from that it’s a rather fine unit, with loads of power, a reasonable range of adjustability (5 stops overall) with nice logical controls. Although it doesn’t have a digital display for output the power bar is excellent for both quickly monitoring the setting and indicating ‘flash ready’ changing from red to green - though it also has the acoustic ready 'beep' option. Everything about this head feels substantial and positive, which makes a nice change from many of the lower end Multiblitz offerings. Buying a rather old (the Variolite Compact was first produced in 1992) second hand unit isn't without risk, but Multiblitz, from personal experience have proved to be supremely reliable over the years. 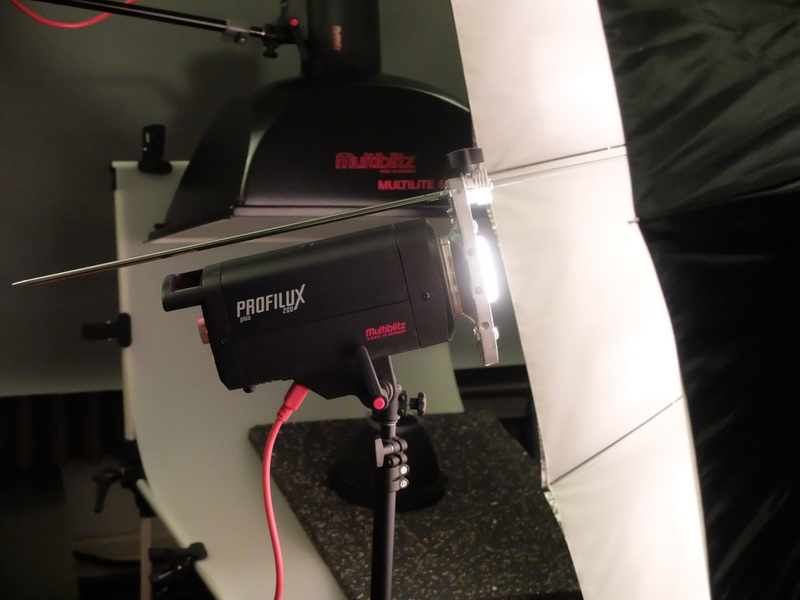 Indeed there are still many Ministudio/Minispot flash heads, like those that started me off with studio lighting still see action today - and those date back to the mid 1970's! Multiblitz has an extensive (though costly) range of modifiers available in both the 'P' (small) and 'V' bayonet fitting, there is also a growing number of third party suppliers becoming available, though this is mainly through the use of 'soft-box' speed-ring adapters. Third party softboxes have been available for many years now and some of them I consider to be better than the OEM Multiblitz ones and at a substantially reduced cost. 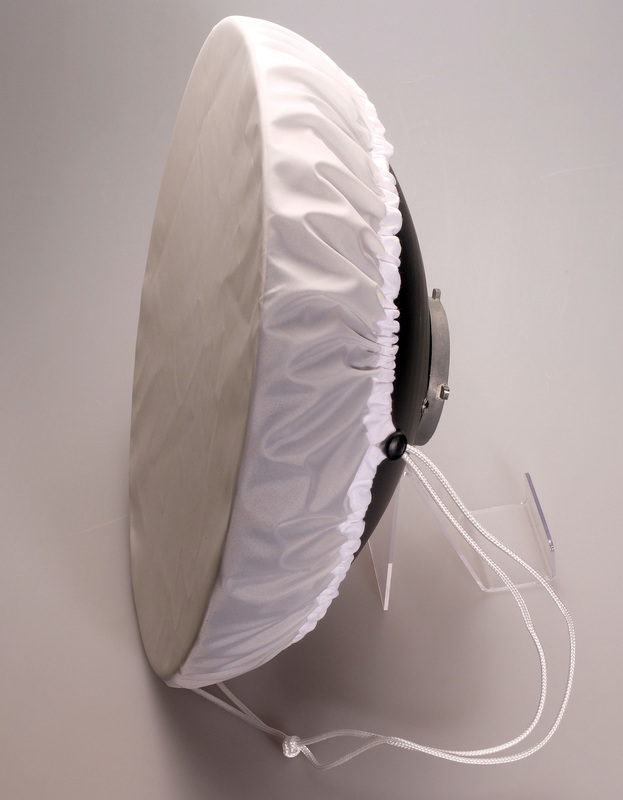 There is one feature I did like about some of the earlier OEM Softboxes and that is the use of a reflector (deflector?) disc, like those used on beauty dishes, rather than the more common internal diffuser panels. I’ve always felt that this provided a more uniform and efficient light source – but I don’t know if this arrangement is still being used as I feel that the Multiblitz range of softboxes are too costly for me to invest in so haven't investigated them. Of course with Elinchrom there has always been the option to use a similar set-up with their optional deflector kit and the heads 'brolly socket being near the flashtube. Then again with the new style of umbrella type softboxes that have a central shaft this effect should be perhaps fairly straightforward to create? Whilst on the subject of modifiers I should perhaps mention that there is a slight difference between the early (plastic) and current 'P' mount. Whilst the metal 'P' mounts certainly fit on the older Minilites with no problem - if anything a bit loose, the older standard reflectors that came with the Minilites are not a good fit at all on either the Compact or Profilux - very tight, but nothing that couldn't be resolved with a bit of careful filing! Perhaps this was intentional as the small 50 watt halogens on the Minilite never really produced a great deal of heat, unlike some of the halogens used in the later 'P' mount lights and this was to reduce the likelihood of the plastic mounts being heat damaged, but that is only speculation on my part. Two of the more unusual modifiers I use are the Fresnel (pronounced 'Fren-el') Spot and the Focusing or Optical Snoot/Spot . The former with a 'P' fit mount and the later for the 'V' mount. The Fresnel is very much like an old movie or stage light giving an even circle of light but without a hard defined edge. This unit is also fitted with an 'iris' allowing you to reduce the diameter of the pool of light. 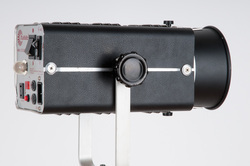 Conversely the Optical spot provides a defined, hard edged spot of light. 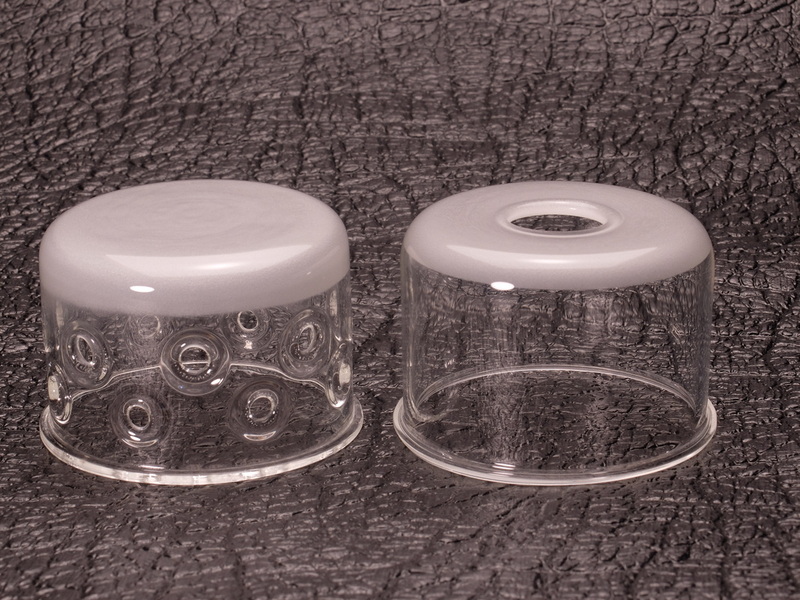 This unit has a slot between the element to slide in a 'gobo' (a patterned effect) holder and also an iris. The front element slides back & forth allowing you to focus the projected image - or not if you so wish. 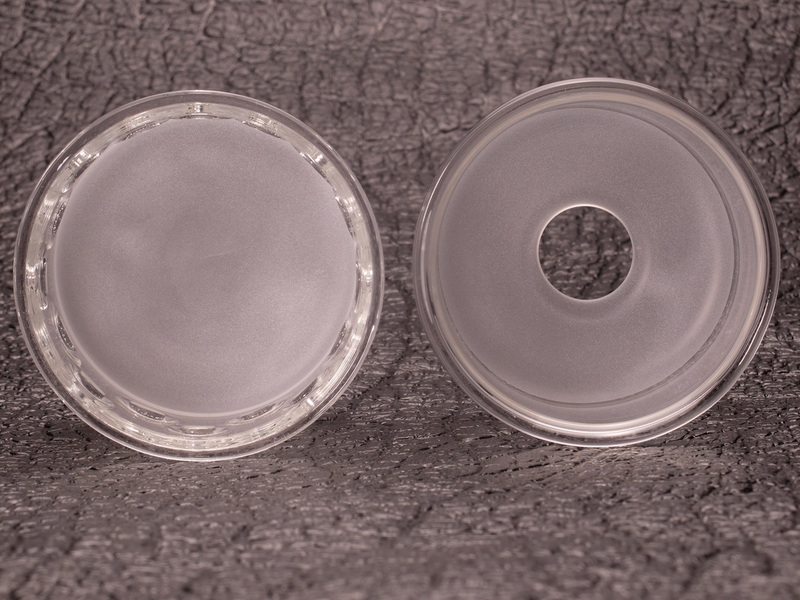 There is also a front cap which when removed adds an overall haze about the lit pattern, all of which allows you the units ability to add extra elements of creativity to your photography. Over the years Multiblitz has produced several differing spot units, the current version looks like many that are offered on eBay these days with interchangeable 'speedrings' - even Multiblitz's own instruction leaflet (downloadable from their site) shows the unit with a Bowens fitting on page 3! As for the Fresnel, there seems little information on it for the 'P' mount, but the 'V' mount version is still shown on the .com site, but not on the .de one, but I think it's a wonderful lighting tool. I have to state that I've not used or even seen one of these in the flesh, so the following views are based purely on information garnered from the 'net' and Multiblitz brochures. 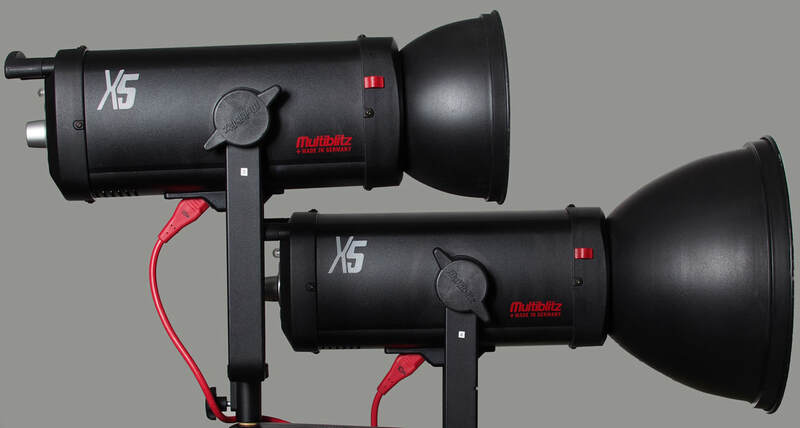 I was quite interested when I heard a 'budget' V mount light was to be launched by Multiblitz, but somewhat disappointed when the specifications & first pictures came out! 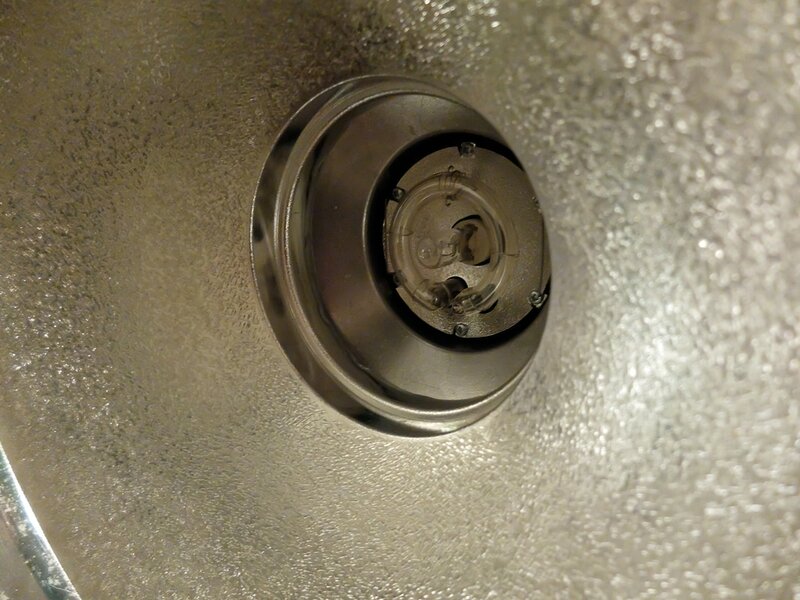 Now I would rather like to convert over to the more Pro' V mount lights so hoped this would allow a reasonably cost effective transition over time. There were several areas of disappointment for me the stand mount/tilt arrangement looks similar to that used on the Profilux Plus (one of the things I least like about those heads) it isn't Trigger Happy compatible in the context of remote control. I suspect it will 'trigger' with no issue, but it would have been nice to have the other remote functions and this is before we get on to the specifications. One of the things I really do rate the Profilux Plus's for is their short flash durations, output variation & reasonable recycling times (at UK 240 volts). The poor Xlite seems, well, rather lite on all these aspects, even more so when you compare it to the now out of production Xenolux 500; same output & variation, shorter duration and recycle times, which given my assertion that even old Multiblitz units are reliable would seem to be a more sensible option. Add in the vastly superior stand mount bracket and the only downside is the lack of in-built receiver, so I think I'll be looking toward the Xenolux (or saving toward the X) range when I want to adopt further V mount lights. All this of course is without any knowledge of the UK retail price of the Xlite, but having seem ex-demo Xenolux 500's for £400 and the Multiblitz (Germany) online shops price of €891.31 for the Xlite, I won't changing my mind! Perhaps time to change things (August 2016)? The other thing I'm doing is updating my modifiers from the older plastic mount ones I've had all these years since the Minilite's. So new standard reflectors (FILNOS) have been purchased a larger 25cm (FILNOS-2) though in reality it's a bit bigger than this at 27cm as Multiblitz don't seem to include the reflectors outer 'lip' in the measurement. I have also purchased an old Multiblitz COMMUL-1, a rigid 50x50cm softbox or 'tub', which I've wanted for ages. This produces a nicely balanced defused, but at the same time crisp light which is great for still life work and much better that the quality my usual softboxes. This is probably down to the white inside and no internal diffusion. I've also changed my softboxes and gone with the Lastolite Ezybox 'Switch' range as I liked the two in one option they provide - my thoughts on these can bee seen in my Studio Thoughts page. 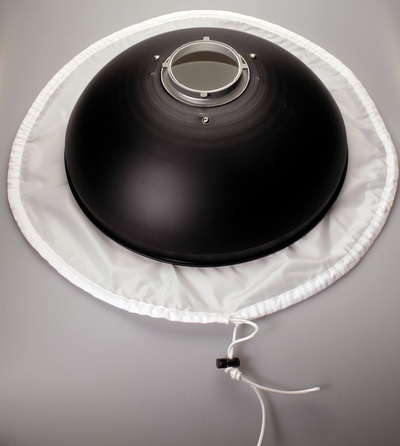 On there I mention that unlike other softboxes, where normally you'd lay the softbox face down and mount the light to it there, this isn't really practical with these. Well as I seem to be getting more clumsy these days and as a preventative measure, I decided to invest in some Pyrex protective domes (PLUSKLA) to cover the tubes and modelling lights. Now on the Multiblitz site these are still shown as having a fully 'frosted' front with multiple holes around the outside, however on ordering one this wasn't what arrived! Old on the left, new on the right, not that it makes a difference to the light/flash pattern or quality, I just like the old design and felt a bit disappointed that even Multiblitz's own site wasn't up-to-date - anyway sought out and bought a couple of the old design ones in the end. I've also been thinking about trying out a mid size parabolic 'brolly and quite like the Multiblitz PARABROL-­165-P. One thing I did notice is that the adapter/reflector/mount is in essence a softbox speedring and mount with a tube to locate and lock the 'brolly shaft. Using a speedring gives the light output a far wider degree of illumination than the normal umbrella reflector (PLUSCH) 120 as opposed to 85 degrees. Now as I always have loads of spare speed rings and mounts it was time to rummage through the metal bin to see if I could find something I could use and adapt one of my old speedring mounts - well the end result isn't perfect and the 'engineering' leaves a bit to be desired, but I only have limited hand tools and I'm quite pleased with the end result. I even have a 'flat' speedring somewhere which would be like using the flash head almost in effect bare bulb mode. In Praise of the Multiblitz WEWSOF! 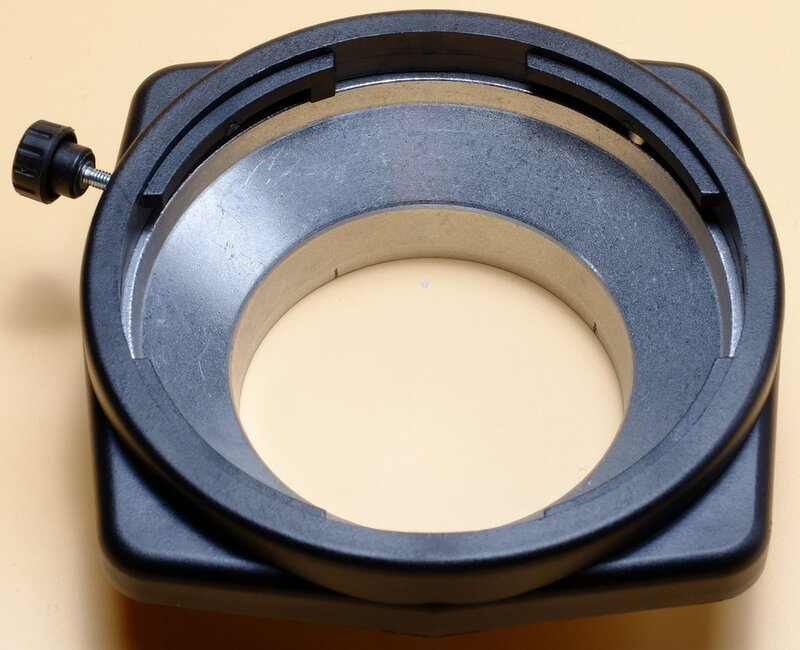 V mount; RINOS-2, RINOW-2, RINOS-3, RINOW-3, RIWEW, RIBEAU & perhaps even the RIENG, though why you’d want a softscreen on a narrow angle reflector is debatable. Also the no longer in production wide angle 33cm RIWEI. 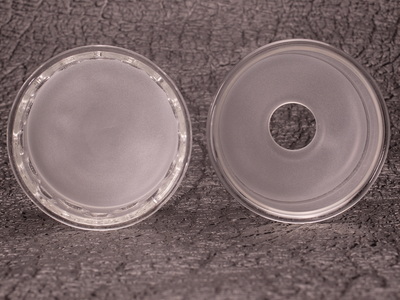 So replacing the need for RISOF-2 & 3 for 25 & 30cm reflectors respectively. It also lists the WEWSOF as being “Heat resistant up to 1250 W” so usable across all the lights currently in production (Pro X compatible). 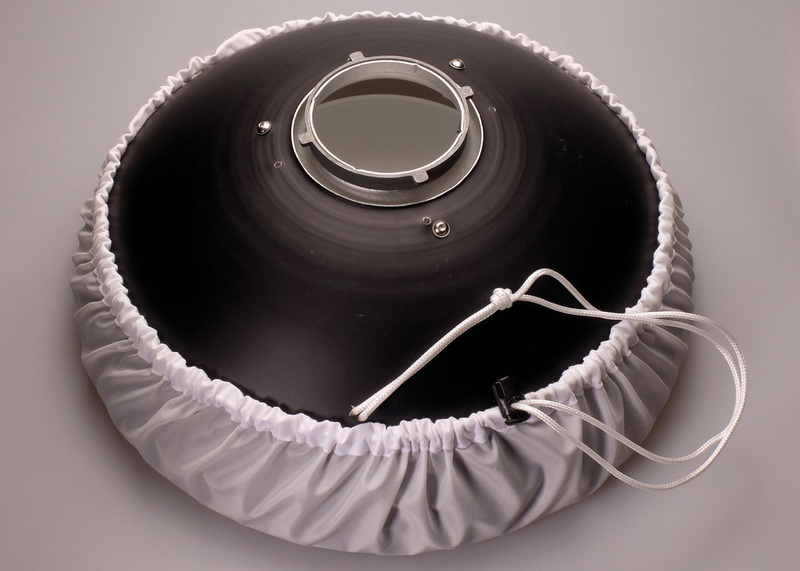 OK not cheap for a bit of heat resistant cloth, but far more economical than buying individual softscreens for all sizes of reflector, oh and as I know to my cost, some of those bundled ‘shower caps’ supplied with cheap beauty dishes are certainly not very heat resistant! It could perhaps do with a simple leaflet to show how best to get the thing on, but you soon learn to open out the circle, place the reflector face down in the middle, then simply pull the cord tight. Yes you may have noticed that my little beauty dish is the result of some adaptive surgery, but that’s another story...did a quick test this evening and found that this fabric diffuser reduces the output of the head by just under a stop against the normal ‘film’ version that I have for my FILNOS reflector. January 2017 - and a new flash head has been delivered. Well I have to say that this was a bit of a surprise as I never thought I'd end up with this particular model - the Profilite 500! On paper it doesn't really have much to offer on the 'pro' side of the equation & quite a bit on the 'cons' side. I can honestly say that I've dismissed this unit in the past (and its predecessor the Profilux Eco) as being overpriced for what is on offer. My first choice of a new would head would have been without question the X5 as it seems to have everything going for it; fast recycling (same as my profilux Plus 200's), very fast flash duration, superior build...but I couldn't justify the price of ownership based on my amateur status. Anyway I was settled on the Profilite Plus 2, which would have seamlessly matched my current lights, however just after Christmas I was looking on the Harrison Cameras website (who now handle Multiblitz in the UK) and noticed in their sale they had a Profilite 500 kit (including stand and softbox) which was £200 cheaper than the Profilite Plus 2.
slow recycle time - almost 3 times longer at 1.7 seconds as opposed to 0.6 at full power. poor flash duration - minimum of 1/772nd against 1/3000th of a second (this is the 't5' standard) at maximum output. no Trigger Happy remote integration - though it does work as a basic trigger with no problem. less output control, 6 as opposed to 7 stops - in my opinion the more powerful the unit the more variation is needed. Price - now this is of course negated at the offer price and even when not on offer I have to say that Harrison Cameras are very competitive, based on Multiblitz's online shop. physically, visually and operationally very similar to the 200's. higher power - useful for use with modifiers like the Fresnel which dramatically reduce the output. In the end, although it is nice to have fast recycling times, short flash duration, I do mainly still life & products so isn't really a show stopper, though the lack of remote integration and reduced output variation nearly were, but in the end it was the offer price that was the deciding factor! Multiblitz have never been cheap and I have to confess that recently I've been looking at other brands, in particular the latest Elinchrom's but decided to stick with what I know and has proved reliable over the years. I must also praise Harrison Cameras who have provided excellent service over the last few months and once again reiterate that they seem very competitive - though nothing Multiblitz branded is ever going to be considered a bargain! As can be seen below in the comparison pictures that both the Profilux Plus and the Profilite really are very similar and this means that the new head slots right into my storage/flight case. After I first got the new Profilite head I did some initial output measurements alongside my Profilux Plus’s and I must say the slow recycle time was rather a pain, even at lower settings. The other issue was that I found the modelling light to be disproportionately bright. I use 70 watt Halolux’s in my Plus 200’s and the 500 comes with a 205 watt Halolux as standard. A quick order was placed with lamps2udirect for some 150 watt replacements – as always, Lamps2udirect not only had them in stock, but at a great price (couldn’t find them anywhere cheaper) and they arrived very quickly, so they remain my first port of call for modelling lights (and other things)! Anyway once fitted the 150 watt modelling lamps seem far more balanced for output between the Plus 200 and the 500. With the decision to not pursue the move to ‘V’ mount lights it was fortuitous that (coinciding with the launch of the M6 TTL & HSS heads) that Multiblitz decided to provide a ‘V’ to ‘P’ mount adapter. I did try and ascertain a bit more information about this prior to purchasing, but didn’t get a response from Multiblitz. 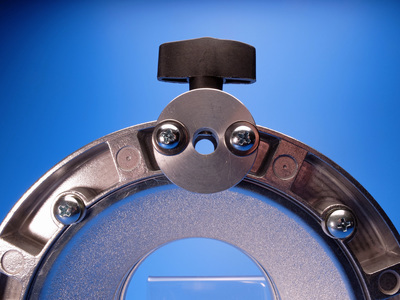 I wanted to know about the relative relationship of the mounts – as the ‘P’ mount is smaller than the ‘V’ I had hoped that it would be placed as far forward as possible so as to try a replicate the position of a the flash tube relative to the ‘V’ mount. 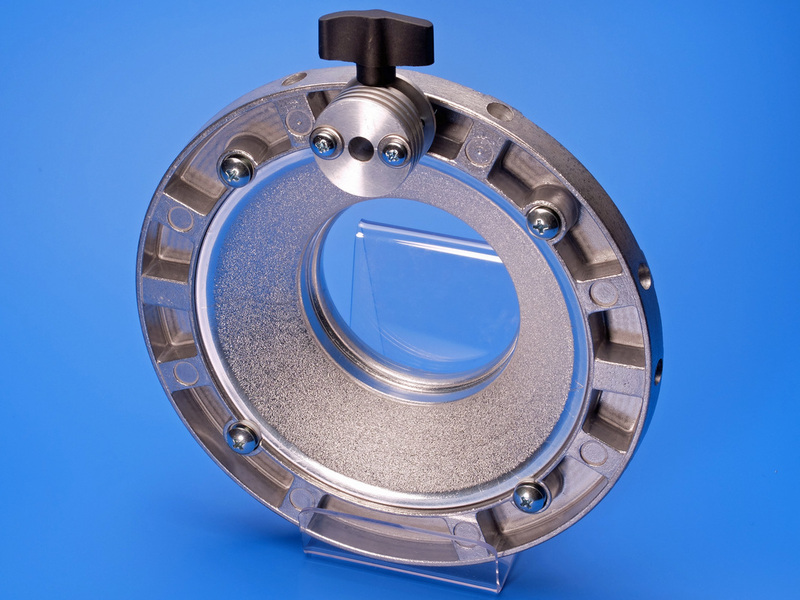 Unfortunately, as can be seen, the adapter looks like an earlier ‘V’ mount front plate from a flash head with a softbox speed mount (flange suitably cut to shape) held in place on the back by a plastic 'over-plate! Now for many light modifiers this probably wouldn't make a difference, but with one of my modifiers - the old wide angle RIWEI the 'P' mount flash tube is completely recessed when the adapter is used. The first picture below shows the reflector on my Variolite Compact Head (Pyrex dome removed to show the position of the tube) the second using the adaptor on my Plus 200 head - third picture just showing the adapter in use between reflector and head. 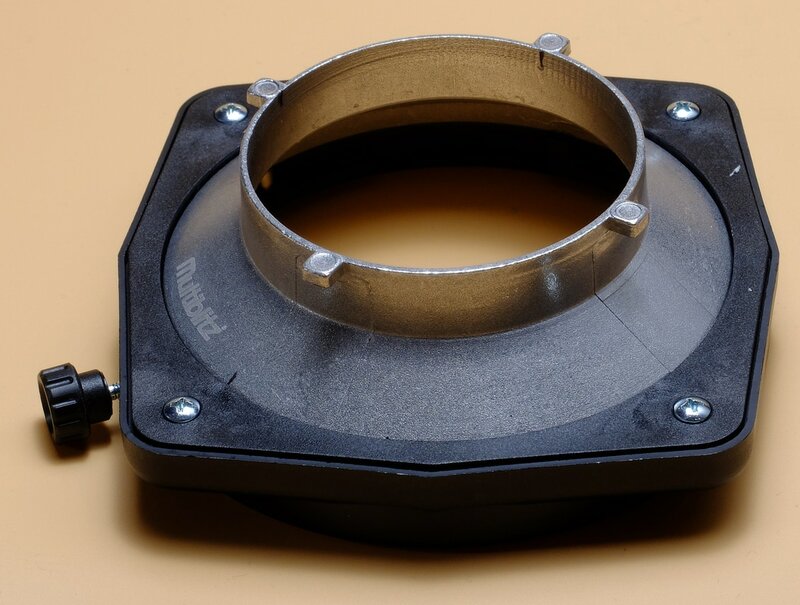 A far better option would have been to use a mounting plate with a relatively flat profile and it isn't as though they aren't available - personally I would have utilised the mounting plate that is used on the COMVER background reflector. This would have brought the flash tube as far forward as possible. After over 35 years of being a Multiblitz user, I'm now looking elsewhere! Yes after all this time I'm now 'officially' moving toward Elinchrom, so don't really expect there to be many updates to this section! This was after a protracted period of procrastination on my part in looking to replace the Profilite 500, which I've just become so dissatisfied with - nothing wrong with the unit per say, but the long flash duration, slow recycle time lack of Trigger Happy integration meant I wasn't really enjoying using it (so currently for sale on a well known auction site). I had finally decided to splash out on an X5, but when I went to buy it, found the price had increased over £300 to £1,329, now the previous £999 was going to be hard to justify, but for me the recent increase in UK prices across all the heads has finally meant I can't justify the purchase of any new Multiblitz heads. Of course I won't be selling off all my current equipment (except the Profilite 500) the Profilux Plus 200's are still a great bit of kit, but the current iteration, the Profilite Plus 2 actually is priced higher than the price I paid for the rather super Elinchrom ELC Pro HD 500, which to be honest has absolutely awesome creative potential - so that's where I've gone! This is very sad news, as although I've been quite critical of Mutliblitz recently there was always the hope that they'd get back in the game with something new and innovative as to be honest I've felt that over the past years they've been treading water, the introduction of the X-lite, the revamps of the Profilux (& Plus) to Profilite was not really anything of consequence for users. Whilst the X System seemed nice, it wasn't really that special (though I have to say that I've only ever had a brief play with an X10) & the launch of the M6, for long term users of the 'P' mount was (I suspect) actually a source of annoyance! Given its triggering wasn't backward compatible with their then current triggers, I'd have been reduced to using my Multiblitz receiver into the syn socket or go corded. Also even if I did have a compatible camera to use their new triggers, these wouldn't trigger the older 'P' mount flashes! 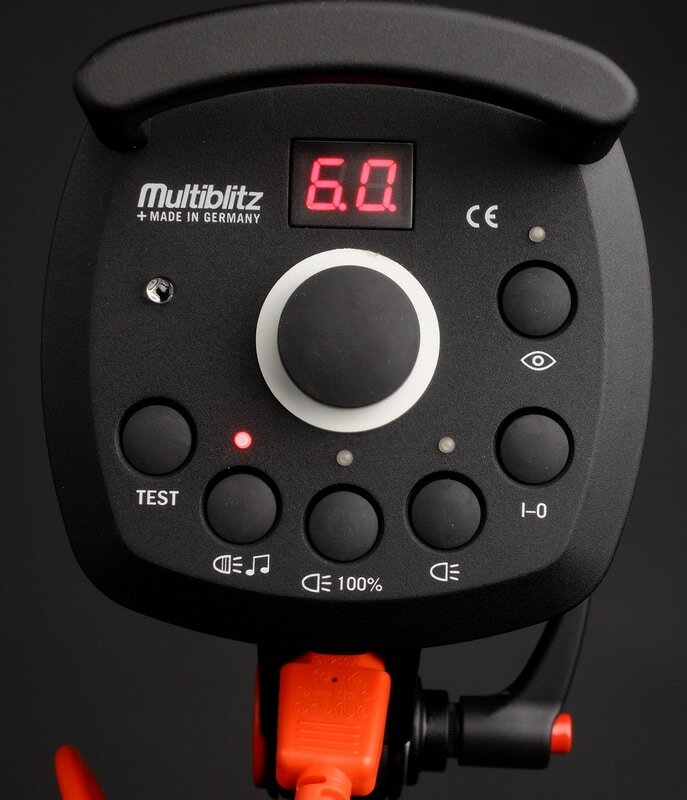 I shall of course continue using my current Multiblitz heads and indeed expect them to perform faultlessly for many many years to come as have all Multiblitz products I've ever owned. As the Multiblitz site(s) have been taken down, I've put together as much information as I could get together from various sources, which might be of use going forward and this can be found in the sub-section attached to this page entitled 'Multiblitz Manuals + Miscellaneous' it is by no means complete, but may prove a useful resource. Now the Fresnel ('s' is silent so pronounce frenell after the French inventor) spot is one of my most used modifiers for still life / product shots with my 'P' mount heads. The Profre, with the smooth transition to shadow without a hard edge and super control over the pool of light with the inbuilt iris is great, so when I saw the 'V' mount version on a certain auction site I decided to buy it as it could, with my 'V' to Elinchrom convertor be used with my current Variolite Compact 900, but also my new ELC 500. Now I've never seen one of these in the flesh before, so I was quite surprised when it arrived, by how small the iris assembly was - wide open it is about half the size of the 'P' mount version, given its relative size, this really restricts the pool of light that is output from the unit. So even better for the still life & product side of things, but not great for portraiture in my little studio - just can't get the distance for a large area of light. To the left are some pictures of the output from; on the left hand side the 'P' mount Profre and on the right the 'V' mount Rastu. 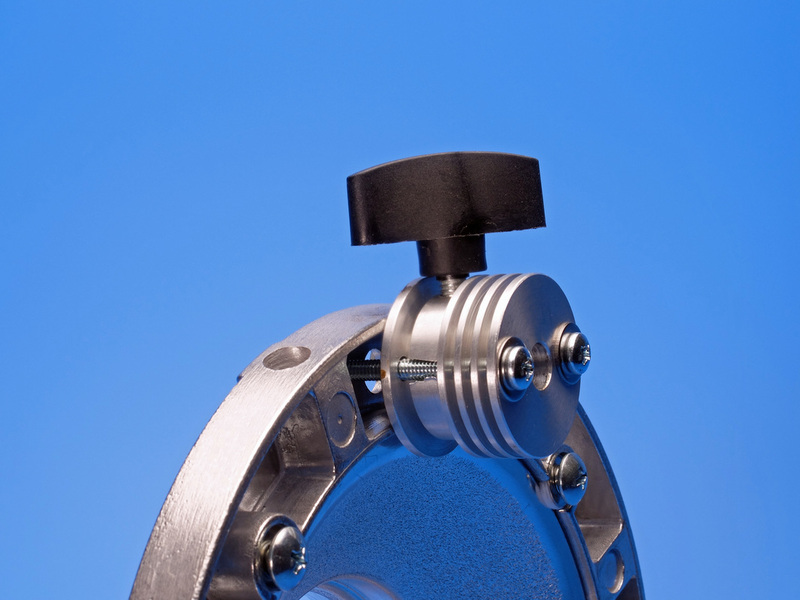 Both heads had the front element of the Fresnel's 1 metre from a wall. The top section shows the output with the iris wide open, the middle with the iris half closed and the bottom picture with the iris as fully closed as it will go. In the case of the Rastu, I had to move to one side as the lit area was completely hidden by the head! In any case I'll enjoy putting this new (to me) Fresnel through its paces over the coming months. Bought these second hand, also a selection of modifiers and grids. they were what I would describe as being in a 'well used' condition, but I got them cheap enough to still consider them a bargain. They both were missing the output variation knobs on the control panel, but although no original ones this is something I have loads of as I DIY audio kit, so popped on a couple of high quality alloy ones, which certainly look more classy than the originals, even if just a smidgen too big! Just finished soak testing - leaving them on for extended period, plus checking their functionality and integration with the TriggerHappy remote - all good. Only thing left to do is explore the 'Speed Mode' setting as the manual is nothing but vague about its parameters and any constraints in real use. 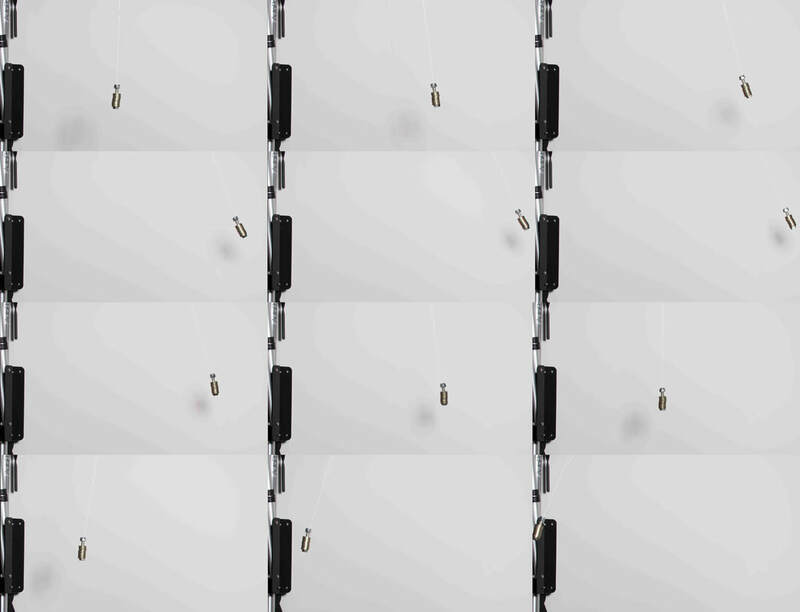 I'll probably set-up a swinging pendulum and use my camera's burst mode(s) to capture a sequence of frames. the spec sheet says the X5 can re-cycle up to 20 times a second, presumably this is at the lowest power setting, but I don't really know due to the vague nature of the manual - guess we'll just have to wait and see. ​Obviously the issue with buying anything Multiblitz now is the total lack of support and spares, but based on past performance I'm happy to take a chance, modelling lamps, well I actually have loads and as for flash tubes, we'll I've acquire some second hand ones, so baring a major faults should have many years use out of these. Finally tried out my camera in 'burst' mode to see how the X5's kept up using their Speed Mode facility. Started at their lowest setting, with my camera set to 9 frames per second, then increased the output a stop at a time until I ended up with the flash not firing (no image captured). Didn't miss a single frame until I went over half power, by nearly three quarter power I was only capturing every other frame. The picture below shows the sequence of frames at half power, unfortunately I was a bit disappointed to see some colour variation, but on the whole reasonably satisfied that I could capture a sequence of movement with the X5's up to about 3 stops from full power if I reduced my cameras frame rate to four per second & double that from half power downward. The other thing I've come to really appreciate about these heads is the fact that all the buttons are illuminated dimly when both in standby mode and when the unit is switched on, but the function isn't in use, just brightens when functions are switched to on. This might not seem too important, but as I like to work in a darkened room, it truly is wonderful and something missing from most brands I've used over the years.